Godaddy is not only a domain name registrar but also they give hosting, email domain transfer and all features that other domain companies provide you. As you go to activate webmail email service of GoDaddy, You should also know how to access this. How to Access GoDaddy Email Through Webmail ? 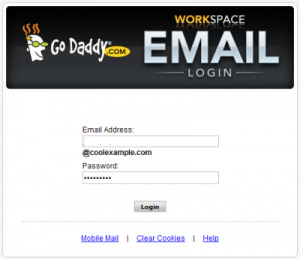 Go to GoDaddy Webmail Login page. Enter your email address that you use to login. Check list of supported browsers on GoDaddy that show on which browsers webmail will work. If you have any isssue than contact GoDaddy Cutomer care. If your email address attached with some other domain owners account than contact that person. GoDAddy also give you options to access webmail with Outlook, Thunderbird or Apple’s Mail.